Xikar Premium Butane Torch Lighter Fuel, Today's fine lighters have sophisticated ignition systems thats why it's more important than ever to eliminate contaminants. 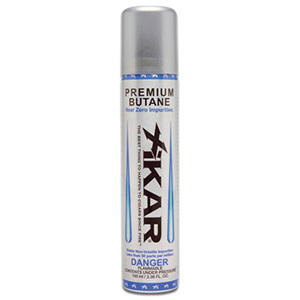 In a recent independent test by New England Testing Laboratory, Xikar butane gas was found to be the cleanest of leading brands tested - and by a wide margin. If you want fewer problems then make sure you buy this butane. Please note that butane is shipped by USPS Surface Mail regardless of the shipping method you choose. Because the flammable gases are prohibited in international mail, the consumers residing outside of the U.S. cannot order butane gas refill cartridge.